Nutella is a household staple here in Italy and if you tell an Italian you don’t eat it, it’s as if you’ve committed a crime. They also look at you like you’re a martian from outer space when you say you make your own at home. They can’t understand why you would go through the trouble. Of course I’m generalizing a bit and there are some health conscious Italians out there who also make their own or opt for the organic less refined chocolate and hazelnut spread varieties, but for the most part, there is only one true Nutella in their mind and hearts. They eat it for breakfast on rusks, for dessert on a crepe and even put it on warm foccaccia. I remember having it at a bar one night several years ago after a few drinks. The server walked out with a tray of warm foccaccia covered in Nutella. I thought I had died and gone to heaven. These days, I can’t stand the taste of it, it’s far too sweet and the powdered sugar flavour is overwhelming. I make my own home made “hutella“, the term my 9 year old niece coined in reference to my healthier home made version of a chocolate and hazelnut spread. I made it for her the last time we were in Canada and she exclaimed “you’re a genius”. Gosh I love that kid. On weekends, we enjoy it on pancakes, crepes or french toast. Weekday breakfasts are a little more simple and usually involve porridge/muesli/granola and seasonal fruit for me and steamed corn flakes, seasonal fruit, coffee and cookies for hubby. Yes, cookies. As an Italian, his breakfast experience is not the same without a cookie to dip in his coffee. In fact, cookies are categorized as a breakfast food in the online shop of most supermarkets here. 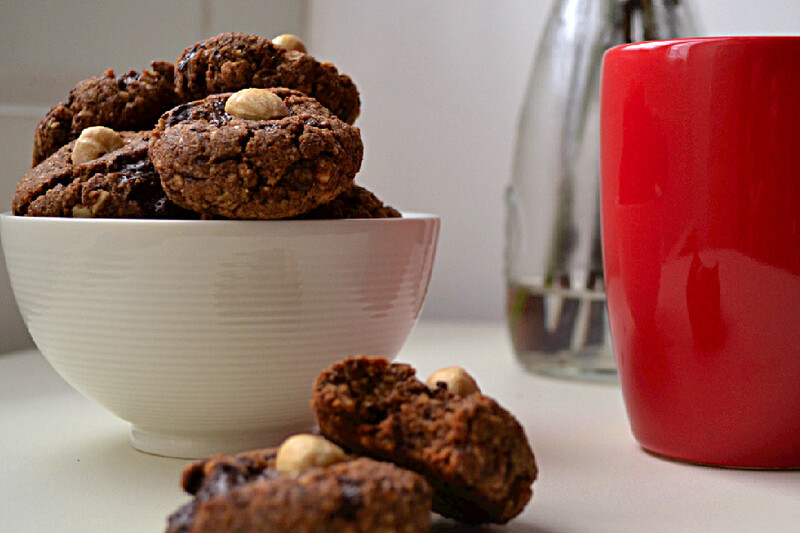 I set out to create a grown up cookie that was perfect for dunking, lower on the glycemic index and higher in nutritional value than commercial varieties, with a rich chocolate and hazelnut flavour. After several test runs, I finally came up with something I’m proud of and that is hubby approved. I knew I had done well when hubby said “wifey questi biscottini sono spettacolari/these cookies are spectacular” with his mouth full and another cookie in hand. 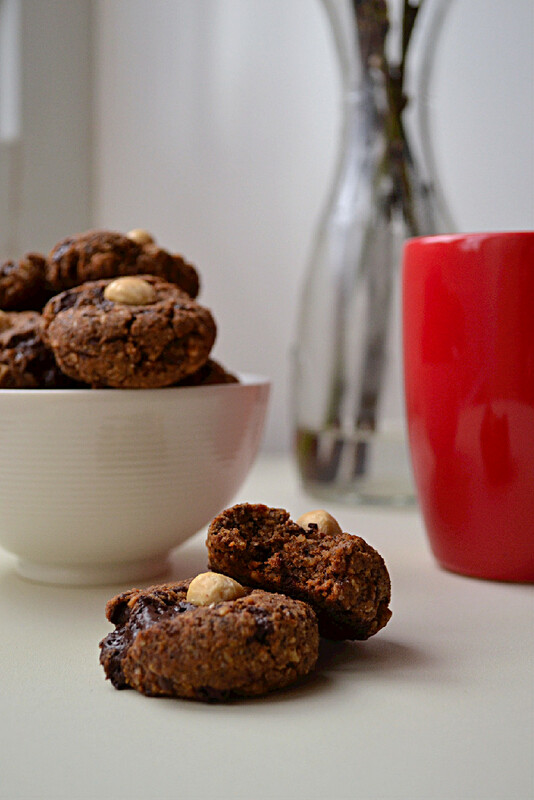 They’re still cookies, so moderation is highly recommended, but at least they’re oil free, refined sugar free, vegan and gluten free and made with the goodness of whole food ingredients; home ground buckwheat flour and hazelnut meal, creamy hazelnut butter, 92% dark chocolate bar and crushed hazelnuts and sweetened with coconut sugar and maple syrup. Buckwheat which has nothing to do with wheat at all, is actually a member of the rhubarb family. It’s naturally gluten-free and can be eaten as groats, flakes, or ground into a flour. It can be used to make raw porridge, cooked porridge, granola, or pilaf and salads in place of rice and other grains. The flour is versatile and can be used to make pancakes, cookies, and other baked goods. Buckwheat is an excellent source of protein, fiber, B vitamins, manganese, magnesium, copper and phosphorous. It is naturally rich in rutin, which helps lower blood pressure, and protect against heart disease and atherosclerosis by preventing platelet aggregation, blood clot formation and lipid oxidation (free radicals that create harmful blood cholesterol). Buckwheat has also been shown to reduce the risk of diabetes and control blood sugar levels. In macrobiotics, buckwheat is known to be a Yang or warming food and is highly recommended for consumption during the cool winter months. Not surprisingly, buckwheat is used extensively in Northern European countries where the climate tends to be cooler. Add buckwheat flour, hazelnut meal, coconut sugar, vanilla, sea salt, and baking soda to a bowl. Mix well to combine. Create a well in the center and pour in hazelnut butter and maple syrup and stir to combine. Add crushed hazelnuts and chocolate chunks or chips and water 1 tablespoon at a time and stir until the mixture comes together to form a cookie dough. Form 12 cookie balls with your hands, place on cookie sheet and press them down slightly to flatten them. They won’t spread much, so you don’t have to worry about spacing them too much. 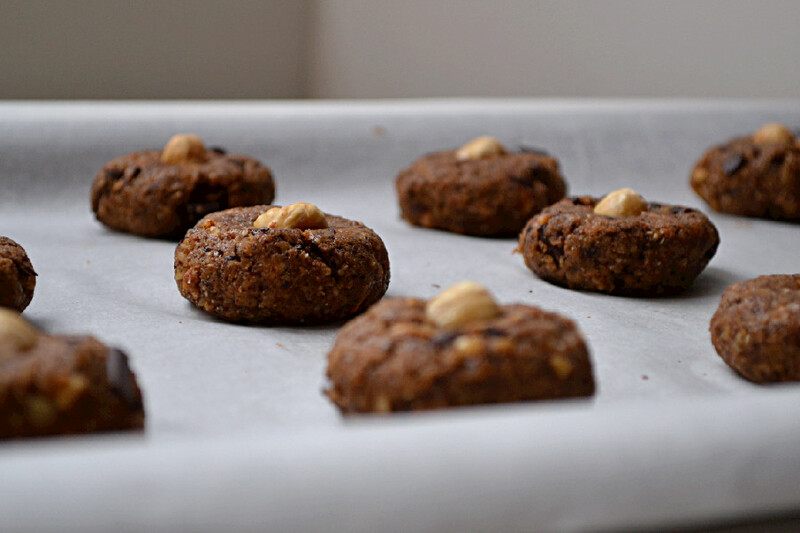 Press half a whole hazelnut into the center of each cookie and bake on the center rack for 15 minutes. Remove from oven and let cool until set. They will seem a bit undone and soft at first, but you just have to give them some time to set. Do not over bake them, or they will dry out and the chocolate will burn. Another recipe of yours I will be making, lol! These look so perfect and easy and I have all the ingredients. They look perfect, healthy and all the ingredients I already use in my baking. I have buckwheat flour and don’t use it often since it imparts a strong flavor, but I love that it’s not ALL the flour used here and I can totally see how it would compliment the hazelnut flavor. Yum. Thanks so much Brandi. I know what you mean about the strong buckwheat flavour. It has taken me ages to get a buckwheat cookie I like. The buckwheat flavour is definitely there here, but it’s subtle and compliments the chocolate and hazelnut. Its a grown up sophisticated cookie…lol. Thanks so much Jana. It is a fine line but it’s quite tasty with the right combination. I hope you have time to try these. Thanks Audrey. Yes they are Nutella addicts over here. Not sure if my comment went through so commenting again because I definitely want you to know that these looked delicious! LOVE dark chocolate, nutella and buckwheat so I know I’d love these! Grown up cookie or not, get in my mouth! Thanks Sophia. These cookies are definitely the kind you want to hide from people so you can eat them all yourself…lol. The last time I made them when we were down to 4, literally the next morning I think, I turned around at breakfast and when I turned back hubby had already shoveled down 3…I had to fight him for half of the last one. This recipe is fantastic, my favourite flavours hazelnuts and chocolate. Heavenly! They were gone within a day. So glad you enjoyed them Enna. You should try the chocolate chip cookies for Santa next. There’s a bit of hazelnut butter in there and it really shines through.